Procedure: Delayed loading of dental implants in the esthetic zone of the maxilla. Guided bone regeneration (GBR) for compensatory augmentation with subsequent exposure after healing. Contents: Soft and hard tissue loss leads to esthetic problems, even in patients with successful implant osseointegration. Delayed loading of dental implants in the esthetic zone is frequently indicated in dental practice, for example, in patients with congenital absence of the lateral incisors. Dental implants can solve this problem. Depending on the extent of hard tissue loss, it may be necessary to perform guided bone regeneration (GBR) in order to achieve better esthetic results. Depending on the degree of atrophy, GBR may be performed before or simultaneous with implantation. Correct implant placement is essential to achieving the end goal: an esthetically pleasing and natural result. 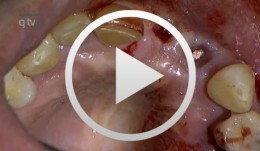 In this film and in the presentation, we will demonstrate in detail the procedure for placing implants in this esthetically sensitive region. In addition, we will demonstrate a method of impression-taking that provides dental laboratories a better foundation for achieving excellent esthetic results. 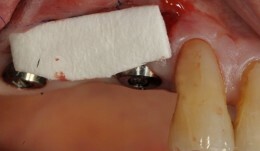 Objectives: To reduce morbidity of lateral window sinus grafting using a minimally invasive (flapless) surgical technique with piezoelectric osteotomy and hydraulic pressure from the same instrument. The grafting material was Bio-Oss collagen, a well-documented material for regenerating bone in the maxillary sinus. Methods: Five patients in the private clinic of the author were randomly selected for the study, and cone-beam CTs (CBCTs) were taken. Patients with at least 3mm of bone from the crestal ridge to the floor of the sinus and a width of more than 6mm were recruited. 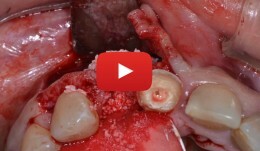 In order to prevent resorption of the crestal bone, a flapless approach was used, with tissue punches. Preparation of the osteotomy and fracture of the floor of the sinus was performed using the Intra Lift Kitä/®. Hydraulic pressure was applied using the same instrument to lift the Schneiderian membrane. The integrity of the membrane was confirmed by the Valsalva test. Bio-Ossä/® collagen block was soaked in saline and cut in to pieces, then each piece was introduced into the osteotomy using tweezers and TKW5TM/®, beneath the elevated membrane. The diameter of all implants was 4.5mm. The osteotomy was undersized by about 1mm to ensure that all implants had good primary stability. They were covered with healing abutments on the day of surgery and IOPA were taken. After a 6-month‘ healing period, implants were progressively loaded with composite crown before final fabrication of the definitive crowns. Further CBCTs were taken after 6 months to confirm bone growth in the sinus. Results: Membrane perforation was observed in one patient in whom the implant was placed in the upper second molar region due to inadvertent slippage of TKW4TM/®. However no complications were reported. 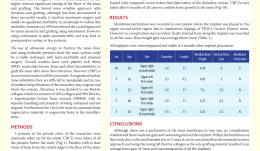 Newly formed bone along the implant was recorded in all cases, and average bone height gain was about 5mm. Conclusions: Although there was a perforation of the sinus membrane in one case, no complications occurred and there was bone gain and osseointegration of the implants. Given the small sample size of five cases, it seems that the minimally invasive approach using xenograft Bio-OssTM/® collagen as the sole grafting material, results in an average bone gain of 5mm and osseointegration of implants.